The Japanese beetle is considered to be one of the most destructive plant pests; however, controlling these insects is time-consuming, challenging, and extremely expensive. Japanese beetles were initially discovered within the United States in New Jersey in the year of 1916. Since that time, populations have spread rapidly throughout the eastern region of the Mississippi River; however, there are several other states – such as Indiana, Arkansas, Oklahoma, and others – that also deal with infestations. These insects feed on the roots of grass. As a result, they are known to destroy lawns, pastures, and other areas where grass is present, such as golf courses. These destructive insects are detrimental to over 300 different types of plants as they are known to attacks the fruits, foliage, and flowers. The adult version of the Japanese beetle has an oval shape and is just under an inch long. The wing covers are typically a copper brown color and the body is usually a type of metallic green color. The sides of the insect have patches of white-colored hairs. There are antennae, which are distinguishable by their clubbed ends. They may spread these out. If so, the antennae resemble that of a fan. The larvae look like a whitish-colored grub. The Japanese beetle larvae eat the roots of grasses. This is similar to the white grubs that are known to damage turf. Because of their feeding habits, root pruning occurs. This detrimentally impacts the ability of the plant to get the water that it needs to survive. The plant then dehydrates and becomes damaged all the way through. 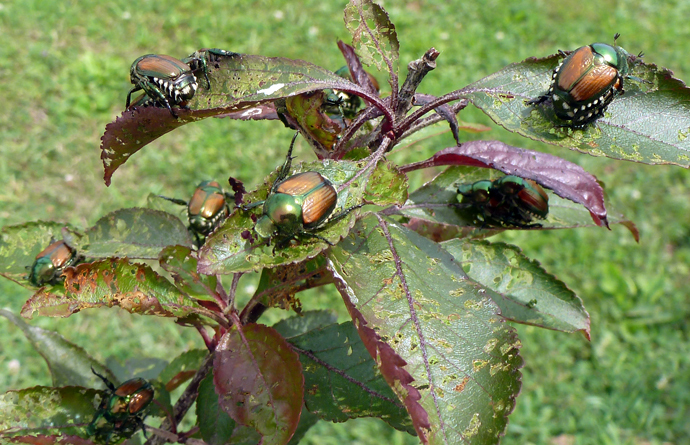 Adult Japanese beetles feed on the buds, the leaves, and the flowers of many different types of plants. The most common types are those used for landscaping and those that are found in gardens. The area where leaves are consumed is that which is located next to the veins of the leaf. The feeding pattern that is left behind on leaves is often referred to as “skeletonizing”. When feeding on flowers, the Japanese beetle creates ragged edges. Other types of plants may show patchy areas where feeding has occurred. Japanese beetles are attracted to some plants more than others. Rose blooms, Canna Lilies, Willow leaves, Hibiscus, Cherry and Sycamore trees are a few that are highly susceptible. Ageratum, Arborvitae, Ash, Baby’s breath, Garden Balsam, Begonia, Bleeding heart, Boxwood, Buttercups, Caladium, Carnations, Chinese lantern plant, Cockscomb, Columbine, Coral Bells, Coralberry, Coreopsis, Cornflower, Daisies, Dogwood (flowering), Dusty-miller, Euonymus, False cypresses, Firs, Forget-me-not, Forsythia, Foxglove, Hemlock, Hollies, Hydrangeas, Junipers, Kale (ornamental), Lilacs, Magnolias, Maple (red or silver only), Mulberry, Nasturtium, Oaks (red and white only), Pines, Poppies, Snapdragon, Snowberry, Speedwell, Sweet pea, Sweet William, Tulip tree, Violets and Pansy, and Yews (taxus). 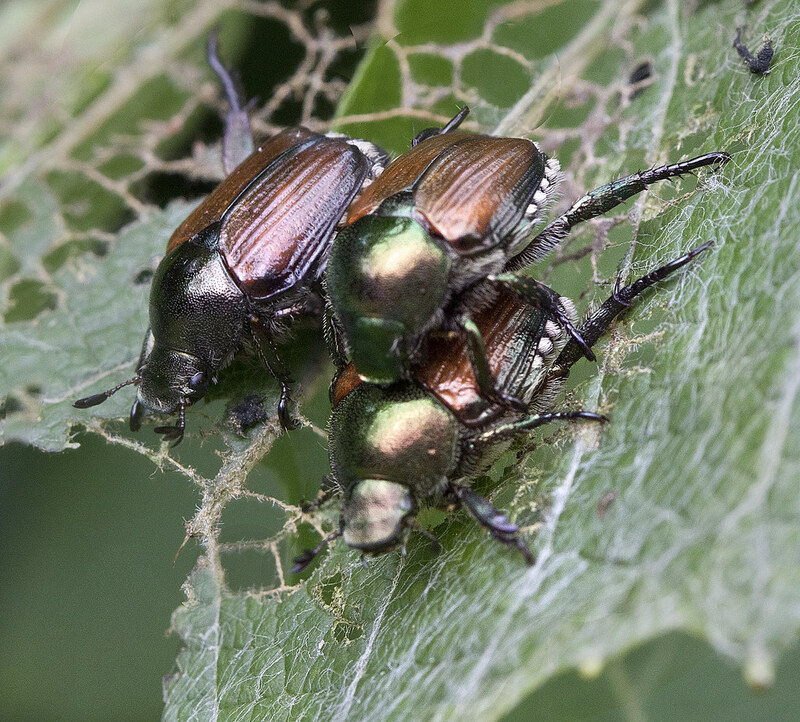 Controlling and managing Japanese beetles is a challenging undertaking. If you have a small infestation, you may be able to hand pick the insects from the areas where they are congregating for feeding purposes. However, in most instances, this proves to be ineffective because the insects release a pheromone that attracts others of their kind. You may also use pesticides to control and manage populations. Unfortunately, over-the-counter products typically only provide short-term relief. Examples of pesticides used include permethrin, carbaryl, and malathion. Extracts may be used, too. The most productive extract is Azadractin. If you want to control, manage, and completely eliminate Japanese beetle infestations, you should opt for professional pest control services. We here at All Pest have the ability to assist you quickly. We use a specially-blended pesticide that will not only eliminate current infestations, but, will deter future infestations from occurring. For more information, please Contact us Today.